The platelets are cells in the blood, which are responsible for coagulation. If they are active for blood clotting, they also set free growth factors. It has recently been discovered that these growth factors can increase the healing rate of transferred fat. 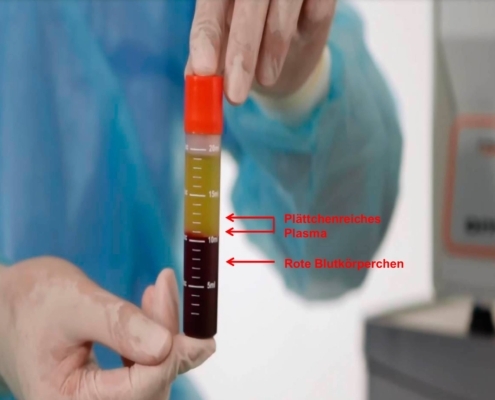 By platelet-rich plasma is meant blood plasma that contains a higher number (concentration) of platelets than normal – not enriched blood plasma. Around the world, research has been carried out to optimize the use of PRP for autologous fat transfer. By using the latest technology, PRP can even be obtained without losing any blood. The latest techniques allow up to a 5-fold concentration of PRP in the transplanted fat. These parameters (5-fold concentration of platelets and one-fifth of the fat volume) allow an improvement in the healing rate of 15% – 30%. This is a similar improvement to stem cell enrichment, but is much less expensive. Above all, however, one requires no additional fat as is required for the stem cell enrichment, meaning the “fat reserves” of the patient will not be depleted using PRP method. So you need for a bilateral breast augmentation with 250 ml of autologous fat (= 500ml total) 100ml PRP. This amount can easily be obtained without blood loss and with a relatively low cost, without any physiological stress for the person concerned.